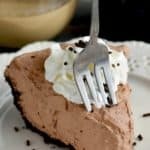 This No Bake Baileys Chocolate Pie is the perfect easy dessert . . . with booze! In a large bowl combine the whipped topping, dry pudding mixes, milk, Baileys, and vanilla extract. Using a hand mixer, mix until smooth and you can no longer see pieces of the pudding mix. Pour into the store bought pie crust. Refrigerate for at least four hours. Place in the freezer for 15 minutes right before serving (optional) to achieve nicer, cleaner, slices. Some people have commented that they had difficulty getting this pie to set. One option is to put the pie in the freezer and have it be a frozen pie. It will taste just as delicious. Another option is to put in less Baileys. This might be a great option for you if you just want a hint of Baileys, as it is strong (and delicious!) in this pie.